Within the past 10 years, it has become increasingly evident that posttranscriptional regulation is among the most important mechanisms used by bacteria to modulate gene expression in response to environmental perturbations. Posttranscriptional mechanisms provide a much faster response and lower energy burden compared with most transcription regulatory pathways, and they have the unique advantage that they can override existing transcriptional responses once the environment changes. Because of this, virulence factor gene expression is particularly suited for posttranscriptional control, and not surprisingly, an abundance of recent evidence indicates that posttranscriptional regulators are the predominant virulence regulators of human pathogens. Typically, this involves global riboregulators that primarily serve as modulators of virulence gene translation initiation and/or mRNA stability. Surprisingly little has been reported about posttranscriptional regulatory pathways in oral bacteria, but recent results suggest that oral species are equally dependent upon posttranscriptional control of their adaptive genetic responses. In this report, we discuss the major themes in RNA-based regulation of gene expression and review the available literature related to the most commonly studied oral bacterial species. The oral biofilm is one of the best-studied human associated polymicrobial communities [1, 2]. Detailed studies of individual oral species like Streptococcus mutans and Porphyromonas gingivalis have greatly advanced our understanding of the mechanisms that connect oral biofilm physiology and ecology with pathogenesis [3, 4, 5, 6, 7, 8, 9]. At the genetic level, both S. mutans and P. gingivalis are also among the most thoroughly characterized oral microorganisms, with S. mutans even being suggested as the next Gram-positive model organism . Despite this, surprisingly scant information has been reported in the literature detailing the role of posttranscriptional gene regulation in any oral bacterial species. Recent studies in the traditional model bacteria and several of the more broadly studied bacterial pathogens are just beginning to shed light on the role of posttranscriptional regulation as an important gene regulation mechanism—possibly the predominant one—used to control virulence factor production and stress adaptation responses [11, 12, 13, 14, 15]. Within the next 5–10 years, this emerging subspecialty of bacterial genetics is likely to reshape our view of bacterial gene regulation from its traditional conception as a largely transcriptional phenomenon to one that is heavily focused upon the RNA interactome. Besides the traditional roles of mRNA, tRNA, and rRNA as essential components of translation, small noncoding RNAs (sRNAs) have emerged as a surprisingly abundant source of riboregulatory molecules utilized for the control of gene expression [15, 16, 17]. The rapid synthesis capability and labile nature of RNA  allows for a faster response to environmental changes at a lower energy burden relative to regulatory proteins . The importance of regulatory RNAs will likely become even more apparent with the increasing improvements in bioinformatic predictions for regulatory RNAs and the wider adoption of deep-sequencing techniques like RNA-seq. RNA-seq has already begun to uncover a wealth of novel RNA functions by identifying a large diversity of sRNAs and protein-bound RNAs (ribonucleoprotein complexes) . Furthermore, RNA-seq facilitates the identification of mRNA 5′ and 3′ untranslated regions (UTRs) due to its single base pair resolution. This information can unmask crucial cis-regulatory elements within mRNAs, such as riboswitches . This article describes some of the latest results for RNA-dependent regulation by non-coding trans-riboregulators and mechanisms of mRNA stability. Due to space limitations, we do not include further discussions of riboswitches, but additional information can be found in several comprehensive reviews [21, 22, 23]. Wherever possible, we include examples derived from studies of oral bacteria. However, due to the dearth of specific information on oral species, in some instances it is necessary to use examples from other bacteria to illustrate relevant concepts. For a more general overview of the regulatory functions of RNA, we direct the reader to several recent reviews [11, 15, 16]. Small non-coding RNAs are a surprisingly abundant family of bacterial RNA regulators. It has been estimated that 10–20 % of all genes within a bacterial genome code for RNAs with regulatory functions and yet only a tiny fraction of these, if any, have been characterized in any particular organism [15, 16, 17]. By far, the greatest number of characterized sRNAs is found in E. coli, which contains over 100 confirmed sRNAs , whereas the numbers drop precipitously in most other species. Small non-coding RNAs generally range in size from 40 to 500 nt, which is considerably larger than the analogous microRNA (miRNA) riboregulators found in eukaryotes [25, 26]. In general, the functionality of sRNAs can be grouped into three main classes: (1) antisense sRNAs that block or enable translation/degradation of target mRNAs through seed pairing (hybridization), (2) sRNAs that regulate protein function through sequestration or changes in protein activity, and (3) CRISPR RNAs that provide immunity to foreign DNA . Most of the sRNAs involved in posttranscriptional regulation fall into the first class. These sRNAs can regulate mRNA stability via indirect or direct mechanisms. If target mRNA stability is indirectly affected by seed pairing, it is usually as a consequence of a concomitant modulation of translation initiation induced by the sRNA. As a general rule, translated mRNAs exhibit greater stability due to the intrinsic RNase protection provided by translating ribosomes [27, 28]. Therefore, sRNAs that promote translation tend to increase target mRNA stability, whereas those that impede translation have the opposite effect. By far, the most commonly reported mechanism sRNAs use to modulate translation initiation occurs via changes in access to the Shine-Dalgarno sequence of the target mRNA. If seed pairing promotes translation initiation, this typically occurs by remodeling mRNA secondary structure(s) that would otherwise occlude the ribosome-binding site (RBS) . In contrast, sRNAs that inhibit translation often include the RBS of the target mRNA within their seed pairing regions in order to block ribosome access . Seed pairing may also directly promote mRNA degradation by creating substrates for double-strand-specific RNases, such as RNase III or they may actively recruit RNases to a target via protein interactions with RNA chaperones such as Hfq (discussed later) . It was also recently demonstrated that sRNA interactions can stabilize target mRNAs by directly inhibiting RNase degradation initiated at endogenous RNase cleavage sites of target mRNAs . For either destabilizing or stabilizing interactions, sRNAs that directly modulate target mRNA stability do so irrespective of the translation state of the target mRNA. In the past, posttranscriptional control of gene expression was generally regarded as a mechanism for “fine tuning” the expression of particular genes. However, work in recent years has demonstrated that many sRNAs not only function as dominant regulators of mRNA stability and/or protein abundance, they may also serve as pleiotropic regulators of numerous virulence factors and complex regulatory networks. For example, in Vibrio species, the Qrr sRNAs are expressed at low cell density and are responsible for activating the production of the master quorum sensing regulator AphA, which is responsible for controlling the expression of 300 genes during low cell density growth . In addition, the Qrr sRNAs simultaneously trigger the degradation of luxR/hapR mRNA, thus preventing the production of this high cell density-specific master regulator. Consequently, in Vibrio species, sRNA regulation is the critical control point dictating whether organisms such as V. cholerae express virulence factors via their quorum sensing circuitry . In Staphylococcus aureus, the Agr quorum sensing system directly controls the expression of the global virulence regulator RNAIII . RNAIII is a large multidomain RNA regulator responsible for controlling the switch between surface protein virulence factor expression and the later production of exotoxins . Its pleiotropic regulatory function occurs through both the direct control of virulence factor mRNAs, such as α-hemolysin as well as indirectly through the control of other regulatory proteins such as Rot . For the McaS sRNA of E. coli, this sRNA serves as a pleiotropic regulator of both mRNAs and proteins. McaS directly regulates the production of transcription regulators responsible for curli fiber production and flagella synthesis via mRNA seed pairing, whereas it can also control exopolysaccharide production indirectly by binding to the global RNA-binding protein CsrA [33••]. CsrA orthologs can also be found in oral bacteria, for example Treponema denticola and Aggregatibacter actinomycetemcomitans, but its role in biofilm development, virulence, and/or host interactions have yet to be examined. As more sRNAs and their targets are discovered, it is becoming increasingly evident that sRNAs are likely to be of equal or greater importance to many global transcription regulators for the control of virulence factors and various adaptive responses. Given the sophistication of interspecies and host-flora interactions among oral bacteria, it is conceivable that sRNAs would be ideally suited for controlling these behaviors as well. Such studies have yet to receive any attention in other organisms and could be a novel avenue of research pioneered by the oral microbiology community. Presently, a significant number of oral bacterial sRNAs have either been predicted through computational approaches or experimentally identified using next-generation sequencing (RNA-seq). However, currently only a few of these have known functions. Among the first bioinformatic analyses of oral bacterial sRNAs, an early study by Livny et al. utilized SIPHT to predict 7 novel sRNAs in Lactobacillus casei, 31 in Lactobacillus plantarum, 10 in Lactobacillus salivarius, 18 in S. mutans and 34 in Streptococcus sanguinis. However, SIPHT failed to identify sRNAs in the periodontal pathogens T. denticola, Fusobacterium nucleatum, and P. gingivalis . Although, a more recent RNA-seq study of P. gingivalis detected 11 novel sRNAs [35•]. In A. actinomycetemcomitans, a combination of bioinformatics tools was employed to successfully predict iron- and Fur-regulated sRNAs along with their respective mRNA targets [36•]. The transcription of four predicted sRNAs was confirmed experimentally and all were directly regulated by the iron-dependent transcription regulator Fur, consistent with their bioinformatic predictions. Surprisingly, a deletion of Fur did not result in any observable biofilm phenotype under the tested conditions despite a reported connection between ionic iron concentration and the regulation of biofilm associated genes . In contrast, an overproduction of one of the identified Fur-regulated sRNAs, designated JA03, diminished biofilm formation almost entirely. This suggests A. actinomycetemcomitans likely utilizes sRNAs as central regulatory switches within a sophisticated biofilm regulatory network. A similar picture emerges with another global transcriptional regulator controlling the expression of sRNAs in oral streptococci. The CiaRH two-component system is conserved in all streptococci and controls a variety of physiological processes as well as the expression of multiple sRNAs. In S. mutans, the CiaRH system controls bacteriocin production, natural competence development, biofilm formation, and environmental stress tolerance , while in S. gordonii CiaRH controls acid and oxidative stress adaptive responses and modulates alkali generation . Likewise, a ciaRH mutation triggers similar pleiotropic effects in S. pneumoniae . Additionally, several sRNAs were determined to be directly activated by CiaR in S. pneumoniae and designated as csRNA (c ia-dependent small RNA) . Due to the strong conservation of CiaR and CiaR activated promoters among streptococci, it was possible to identify novel csRNAs in many species including oral streptococci: 3 in S. mutans, 6 in S. gordonii, 6 in S. sanguinis, 5 in S. oralis, and 5 in S. mitis strain B6 and 2 in strain SF100. Expression of the csRNAs was further verified by northern blot analysis in S. mitis, S. oralis, and S. sanguinis indicating a widely conserved role for the CiaRH system in sRNA regulation. Interestingly, due to the diversity of sequences and location for csRNA genes, the authors were able to classify csRNAs into 40 distinct types. Further analysis of csRNA structures identified anti-Shine-Dalgarno-like sequences, which points to a role for these sRNAs as modulators of target mRNA translation. However, the direct targets of csRNAs have yet to be determined. Therefore, it is currently unclear whether they are truly seed pairing sRNAs or have other modes of action, such as protein binding and/or sequestration of other sRNAs. This study also raises an interesting ecological question: what are the factors driving the evolution of the observed diversity in csRNAs, when the main regulator CiaR is highly conserved? It will be interesting to determine whether the actual csRNA targets are similar among oral streptococci despite their sequence diversity. Since seed pairing interactions involve imperfect complementarity, it is conceivable that csRNAs might have a much greater flexibility to evolve without disrupting csRNA function. This information might also indicate whether the evolution of csRNAs is species and/or niche specific. Recently, a variety of additional novel sRNAs have been described in S. mutans including ~900 potential eukaryotic-like microRNAs ranging in size from 15 to 26 nt [42, 43, 44]. Like most other identified sRNAs, none of these recently discovered S. mutans sRNAs and microRNAs have yet been assigned regulatory functions. Such studies will be an essential step forward in order to distinguish which of the numerous noncoding RNAs detectable by RNA-seq are true sRNA riboregulators versus accumulated RNA intermediates possibly created through other RNA processing events in the cell. Although few studies have yet to detail the regulatory mechanisms of oral bacterial sRNAs, a recent study in S. mutans illustrated the role of an antisense sRNA in the control of a chromosomal toxin-antitoxin (TA) module [45•]. TA modules are composed of a stable toxin component encoded together with a labile antitoxin. These modules are widely distributed among bacteria and archaea, and are implicated in cell growth arrest and bacterial persistence during environmental stress [46, 47, 48]. TA modules are classified based upon the mechanism used to inhibit the toxin. The antitoxins from type I TA modules are cis-encoded antisense sRNAs that function posttranscriptionally by hybridizing in the RBS region of the toxin mRNA. The first characterized streptococcal type I TA module was recently described in S. mutans [45•]. The Fst-like toxin and its antitoxin sRNA exhibited the expected difference in stability, with a toxin mRNA half-life of 90 min versus 30 min for the antitoxin RNA. Overexpression of the toxin component led to toxicity in E. coli and S. mutans, whereas this toxicity could be neutralized by co-expressing the sRNA antitoxin indicating its role as a true TA module [45•]. Further analysis of the TA module indicated that the toxin and the antitoxin are transcribed across tandem repeats, which provides a complementary seed pairing region in the toxin and antitoxin RNAs. Interestingly, the proposed seed pairing region between the two RNAs does not include the fst RBS itself, rather hybridization occurs 6 bp downstream of the RBS and continues into the first 7 codons of the fst open reading frame (ORF). However, it has been previously demonstrated that sRNAs can effectively inhibit translation initiation by seed pairing anywhere between 70 nucleotides upstream to 5 codons downstream of an mRNA start codon [49••, 50]. Thus, translation of the S. mutans fst mRNA should still be inhibited even though its RBS is not directly involved in seed pairing interactions with the sr antitoxin sRNA. In many species, control by sRNAs requires an additional protein component to catalyze duplex formation. The RNA chaperone Hfq is the most prolific and best characterized of these proteins [24, 51]. Hfq has the interesting ability to remodel RNA secondary structures to facilitate seed pairing . In addition, it has also been demonstrated to promote the degradation of some sRNA-mRNA heteroduplexes via direct protein-protein interactions with RNases, primarily RNase E in enterobacteria . Interestingly, only about 50 % of sequenced bacterial genomes encode obvious Hfq orthologs and none are found among the streptococci [53, 54]. Other hfq encoding Gram-positive organisms, such as the staphylococci, do not seem to require Hfq for seed pairing . Therefore, for Gram-positive species, it is not yet known whether another RNA chaperone provides a similar function as Hfq or RNA chaperones are simply not required in these organisms. However, it has been speculated that all bacteria utilize an Hfq-like chaperone to mediate sRNA interactions . Due to the small size of Hfq and its high sequence diversity, the current list of Hfq– organisms might all encode Hfq proteins that are simply difficult to detect by homology searches. Interestingly, through our own homology searches and protein domain comparisons, we were only able to identify one clear Hfq ortholog among numerous oral bacterial species. Not surprisingly, this was in A. actinomycetemcomitans (NCBI Locus Tag ANH9381_1286), which is a member of the Gammaproteobacteria and a relative of the enterobacteria. Since Hfq has been demonstrated to significantly impact the pathogenicity of a wide range of important plant and animal pathogens, it is reasonable to assume that Hfq mutations of oral pathogens would also result in significant attenuations in virulence. For example, a recent study has reported that A. actinomycetemcomitans regulates the expression of non-coding (nc) RNAs in a mouse-model of infection [55••]. The study identified 210 ncRNAs, including 75 sRNAs. Out of the 210 ncRNAs, 80 were differentially expressed during in vivo growth, with 39 up-regulated and 41 down-regulated. Notably, an increased expression of hfq was also detected during in vivo growth, which is already suggestive of a role for sRNA interactions in virulence gene regulation. Degradation of RNA is achieved by the action of specific endoribonucleases and exoribonucleases [56, 57, 58]. Best investigated in E. coli and Bacillus subtilis, most mRNA degradation proceeds in a stepwise fashion, often initiated by the removal of the mRNA 5′-triphosphate by a pyrophosphohydrolase, followed by an endonucleolytic cleavage. The endonucleolytic cleavage step is crucial, but not necessarily essential for further mRNA degradation by the combined action of exoribonucleases, oligoribonucleases, poly(A) polymerase, and RNA helicase [56, 57, 58]. In E. coli, RNA degradation is closely associated with the RNA degradosome, which is a large membrane associated multi-protein complex containing many or all of these RNA degrading components [59, 60]. The endoribonuclease RNase E is a principal component of the E. coli degradosome, as it typically initiates the first endonucleolytic cleavage step that catalyzes the further degradation of a target mRNA. RNase E is not universally conserved in bacteria, but it has thus far proven to be essential in species that encode it . RNase E consists of an N-terminal catalytic domain and a C-terminal scaffold domain and the enzyme exhibits a nonspecific preference to cut within single stranded A/U rich sequences of 5′-monophosphorylated RNA [62, 63]. However, there are also numerous examples of RNase E substrates having 5′-terminal triphosphates . Thus, the preference for 5′-monophosphorylated mRNA appears to be context-dependent. The RNase E scaffold domain contains several binding sites for other members of the degradosome as well as a membrane-targeting sequence. Interestingly, the C-terminal scaffold domain also harbors a binding site for the glycolytic enzyme enolase [56, 63]. The role of this metabolic enzyme within the degradosome complex is not yet clear. It has been proposed that RNase E complex formation with an abundant glycolytic enzyme, such as enolase, might help to stabilize the unstructured RNase E C-terminal scaffold domain . The incorporation of enolase into the degradosome has been confirmed for other species as well [58, 64•, 65]. Therefore, this function of enolase seems to be evolutionarily conserved. No information is currently available in the literature regarding the organization or localization of the degradosome in any oral species. Likewise, their central RNases have yet to characterized. Orthologs of the major regulatory RNases found in a variety of oral species can be found in Table 1. Interesting differences have been reported in the composition of the degradosome, suggesting additional species-specific RNA degradation mechanisms. As a general rule, the RNA degradation machinery typically falls into either of two classes: the RNase E mediated machinery as in E. coli or the RNase Y/RNase J1/J2 mediated machinery exemplified by B. subiltis. The remaining components involved in RNA degradation are mostly similar among all bacteria. In B. subtilis, RNase Y likely serves an analogous role as RNase E in E. coli . It is the main single-stranded endoribonuclease and even has similar RNase E-like structural features, with a transmembrane domain and a larger unstructured region that interacts with glycolytic enzymes and other proteins involved in RNA degradation [18, 58, 67]. The results of a bacterial two-hybrid screen suggested that the membrane bound RNA degradosome of B. subitlis consists of RNase Y, RNases J1 and J2, polynucleotide phosphorylase (PNPase), the DEAD-box RNA helicase CshA, as well as the glycolytic enzymes enolase and phosphofructokinase . A similar complex was also reported in S. aureus . However, another study failed to detect an association of RNA degrading enzymes in B. subtilis, except for a heterotetrameric complex of RNases J1 and J2 . Thus, there is still some debate about whether a degradosome complex exists in B. subtilis [58, 67]. RNases J1 and J2 are bifunctional paralogous enzymes with both endo and 5′-3′ exoribonucleolytic activity . Although, it should be noted that RNase J2 only exhibits weak exoribonuclease activity in vitro and is presumed to function primarily as an endoribonuclease in vivo . The 5′-3′ exoribonucleolytic activity of RNase J1 is particularly noteworthy as this activity was only thought to exist in eukaryotes until its recent discovery in B. subtilis [58, 67]. Thus, after an initial endoribonuclease cleavage, RNase J1-encoding bacteria can degrade the resulting mRNA fragments exonucleolytically both in the 5′-3′ direction with RNase J1 as well as the 3′-5′ direction with PNPase. RNase E containing species such as E. coli are thought to degrade mRNAs by successive endoribonuclease cleavages from RNase E combined with 3′-5′ exoribonuclease degradation of the resulting fragments using PNPase [26, 63]. Overall, RNase Y, RNases J1/J2, and the double-strand specific enzyme RNase III seem to be responsible for global mRNA turnover in many Gram-positives [58, 70••]. However, mutational analyses suggest significant differences exist in mRNA target regulation between species. Many of these differences are likely due to the central role of posttranscriptional control of adaptive responses and virulence gene regulation among species. RNases Y and J1 were considered essential in B. subtilis until it was just recently shown that both could be deleted . The resulting mutants exhibit significantly slower growth, poor natural competence development, and defects in sporulation. In contrast, RNase Y mutants in S. aureus and Streptococcus pyogenes (group A Streptococcus [GAS]) only show minor growth impairments [72•, 73], whereas RNases J1 and J2 are reportedly essential in GAS [74•]. Yet, neither RNase J1 nor J2 is essential in S. mutans, but both RNase mutants exhibit a slower doubling time and a dramatically reduced natural competence ability (J. Merritt, unpublished results). In contrast to B. subtilis, neither of these phenotypes occurs in an S. mutans RNase Y mutant (J. Merritt, unpublished results). Currently, the function of RNase J2 is mostly enigmatic in B. subtilis, but a role for RNase J2 in Enterococcus faecalis biofilm formation and pilin production was recently reported [58, 67, 75]. Several studies have examined the role of RNase Y (cvfA) in S. pyogenes gene expression [64•, 72•]. GAS is commonly found associated with the tonsils in the human oropharynx and are a frequent cause of pyogenic pharyngitis . Whereas RNase J1 and J2 mutations are lethal in GAS, an RNase Y mutation exhibits no overt signs of major cellular toxicity [72•, 74•]. However, RNase Y mutant strains are impaired in the production of a variety of significant virulence factors, indicating an important role for RNase Y-dependent regulation in the control of GAS virulence [72•]. Initially shown by Kaito et al. , disruption of the cvfA gene in a GAS clinical isolate (M1 serotype) exhibited attenuated virulence in both a silkworm infection model and in infected mice. Further characterization of established GAS virulence factors demonstrated that the secretion of hemolysin, DNase, streptokinase, and proteases were decreased in the cvfA mutant. Although the functional architecture of CvfA was investigated and RNA binding predicted, Kaito et al. did not identify CfvA as an RNA-degrading enzyme. Later, a study by Kang et al. [64•] used transposon mutagenesis to identify genes affecting virulence factor production, in particular a reduced activity of the secreted SpeB cysteine protease. Confirming the results from Kaito et al. , transposon inactivation of the cfvA gene resulted in a reduced SpeB activity. Our studies of RNase Y demonstrated that RNase Y is directly involved in the processing of the mRNAs for both speB its functionally related gene ropB. Both mRNAs are processed by RNase Y in their 5′-untranslated regions (UTRs) and are actually dependent upon this cleavage to stabilize their mRNAs [72•]. This dependence upon RNase Y processing is the likely source of SpeB defects in the RNase Y mutant. Functional analysis of RNase Y indicated that the protein interacts with enolase and exhibits much of its regulatory functions under nutrient limiting conditions [64•]. This finding opens the intriguing possibility that the association with enolase may serve as a metabolic sensor to connect RNase Y regulation with the energy status of the cell. Our group has also performed a comprehensive analysis of the function of RNase Y on global mRNA stability in GAS [72•]. A surprising finding was that the overall mRNA half-life in GAS is much shorter compared with other species. We calculated the median half-life of S. pyogenes mRNAs to be 0.89 min, with about 85 % of mRNA half-lives being less than 2 min. These values increased about twofold in an RNase Y mutant background further supporting its role in mRNA degradation. For comparison, the median half-life of Bacillus cereus mRNAs was estimated to be between 2.4 min and 5 min, whereas in E. coli, about 80 % of mRNAs have a half-life between 3 and 8 min . We speculate that the unusually short half-life of GAS enables the organism to respond more rapidly to changing environments during invasion. This would give posttranscriptional gene regulation a particularly important role during the GAS infection process that probably serves to help the organism quickly adapt to diverse host defense mechanisms, especially innate immunity. It will be interesting to determine how RNase Y and RNase E influence global mRNA stability in oral bacteria. The oral environment is characterized by rapid and severe fluctuations in nutrient supply, pH, temperature, and oxidative stress in addition to a stringent interspecies competition among the flora. Each of these factors requires a quickly developing, highly evolved response from the oral biofilm community to remain competitive for long-term persistence . Given the phenotypic diversity already observed among the few species where RNases have been examined, one can expect that oral bacteria are likely to have evolved numerous niche-specific pathways that exploit the regulatory potential of ribonucleases, particularly RNases E, Y, J1/J2, III, and PNPase. RNA-dependent regulation is not only scientifically interesting as a newly emerging field within bacterial genetics, but increasing evidence suggests that much of the early adaptive responses that occur in response to environmental fluctuations are heavily reliant upon posttranscriptional regulatory mechanisms. Therefore, such systems are quickly being recognized as a direct link to many of the most important pathways required for pathogenicity. Regulation by sRNAs and RNases provides a distinct regulatory advantage over transcriptional mechanisms for the control of adaptive regulatory pathways, due to the fact that these systems can override the presence of previously synthesized mRNAs . From a regulatory standpoint, there is a great benefit to employ a regulatory mechanism that can quickly reprogram the cell in response to environmental perturbations. Messenger RNAs that may be transcribed as a response to one growth condition may have no obvious benefit in another. Therefore, it is much more efficient to override a previous genetic response than to continue synthesizing proteins that provide no clear growth advantage. In this case, it is not surprising that virulence factors and other accessory genes are frequently controlled posttranscriptionally, as these are most often genes that only provide a growth advantage under specific environmental conditions. For example, success as a pathogen dictates that virulence factor production be exquisitely tuned to the host environment to prevent premature activation of the immune response. A similar rationale is applicable to oral pathogens. However, the situation is even further complicated by the fact that members of the oral flora also compete with each other for survival. One can anticipate that interspecies competitive behaviors are subject to a variety of posttranscriptional regulatory mechanisms. The plethora of likely sRNAs identified through the current limited number of published RNA-seq studies already indicates an important role for noncoding riboregulatory RNAs in oral bacterial regulatory networks. It can be expected that the list of putative sRNAs will increase tremendously as additional growth conditions are examined. Consequently, it is conceivable that further studies in this area are likely to yield an entirely new class of exploitable riboregulatory therapeutic targets. While such an idea may currently sound fanciful, it is noteworthy that a variety of in vivo studies have already demonstrated the efficacy of S. aureus RNAIII inhibitors to treat a variety of biofilm-associated infections [80, 81, 82]. 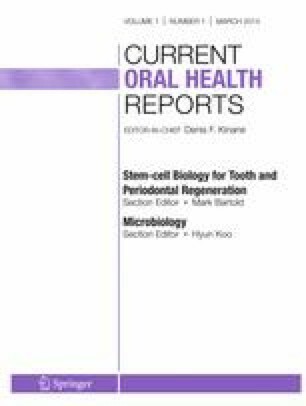 Given the importance of biofilm development in oral diseases, it would clearly be of interest to direct future research on posttranscriptional regulation in the context of the oral biofilm environment. Dental plaque development is strongly influenced by multiple environmental stimuli, including cell density, the presence/absence of nutrients, interspecies competition, and various innate immune components. Virtually nothing is known about how these numerous variables impact the posttranscriptional responses of oral microbes. Such studies are also limited by the lack of available animal model systems that adequately integrate these components of oral microbial ecology. Thus, the development of novel animal model systems will likely reveal key posttranscriptional regulatory systems used to control oral bacterial adaptive responses and pathogenicity. This work was supported by NIH-NIDCR grants (DE018893) to J.M. and (DE022601) to J.K. The authors declare no potential conflicts of interest relevant to this article.